If only we could turn back the hands of time! Well, you can with Google Street View. Click on the clock button in the upper-left corner of a Street View and you’ll see all the older points in time when photos of that spot were taken, going back as far as 2007. The Spontaneous Popup Display (SPUD) is a collapsible 24-inch monitor made mainly of cloth and transparent polymer. Its Kickstarter campaign has raised $176,000 of a $33,000 goal as of this writing. You’re going to need a bigger backpack. Good news for robots? Google Translate is now using Neural Machine Translation to improve accuracy of translations. By taking context into account and translating whole sentences at a time, the results are less robotic, and more like a human speaking with proper grammar. The Web of Trust cannot be trusted since the crowd-sourced site reputation service was caught selling users’ browsing data to third parties. Investigators found they could easily link the data collected to specific individuals, a major privacy no-no. Mozilla has already removed the WoT add-on from its official library. Good riddance. Sam’s Club members had to reset their online passwords after 14,000 sets of login credentials were posted online. I'll bet 13000 of them had the same password: Samsclub1! A phone built for selfies would have the camera lens and flash on its front, facing the user. That’s the new The Asus ZenPhone Selfie in a nutshell. Desperate to reverse declining sales, PC makers will be practically giving away desktops and laptops on Black Friday. Dell, for instance will be offering a limited number of Windows 10 laptops for only $99. And apparently the tablet market is saturated as well. Worldwide sales of tablets sank nearly 15% year-to-year during the 3rd quarter of 2016, according to IDC. Amazon and Huawei were the only tablet makers who showed positive sales growth. It looks like tablets will never become desktop PC replacements. Popping their tops... As if exploding smartphones weren’t enough, Samsung has also recalled 2.8 million top-loading washing machines whose lids can come flying off during wash cycles. A group of French students have invented boxer shorts that block allegedly harmful electromagnetic radiation from smartphones, protecting the family jewels of users who pocket their phones. Over 2,000 pairs have been sold so far, at €30 to €45 each. Tiny robots are exploring the world’s most famous underwater wrecks, including the USS Arizona that was sunk during the attack on Pearl Harbor. The itty-bitty bots can go where human divers cannot. They’re also catching on in the aquaculture industry, says their inventor and Deep Trekker president, Sam McDonald. The LastPass password manager is now free to sync across all of your devices, and its pricing model has been simplified enormously. Existing paid users will still have a few extra features like family sharing for up to five users, 1GB of encrypted file storage, YubiKey and other two-factor login integrations, desktop fingerprint identification and the ability to use LastPass for applications. Unpaid users will see ads. Facebook has shut down a plan to set car insurance rates based upon analyses of applicants’ Facebook posts. UK insurer Admiral thinks that people who use exclamation points and words like “should,” “must,” and so on, may be overconfident and therefore high-risk drivers. You’re worth about $62 a year to Facebook, if you live in the USA or Canada. That estimate is derived by dividing Facebook’s 3rd quarter revenues - almost all advertising - by the number of its users in those markets and extrapolating to an annual figure. 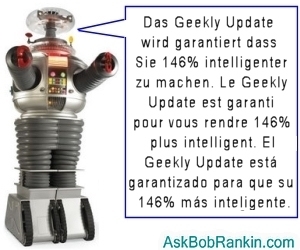 Most recent comments on "Geekly Update - 16 November 2016"
I just went to the WOT site and the first thing that popped up was, "Can Askbobrankin.com be trusted". All Bob has done is post access to a story of how WOT is selling users information. I think that I'll drop them and keep Bob. Facebook & insurance: They "should", and "must" stop that! Immediately! That's one of the dumbest things I've ever heard/read. Car Insurance: We'd like to raise your rates based on Bad Science, and our OWN intuition. Facebook & User's worth: Apparently, I'm worth more to FB, than FB is worth to me. And I AM a users. Thanks for the Lastpass tip, Bob. You're the only report of having to watch ads in the free version that Ive seen. Car insurance rates should be raised if one buys the Zen phone. Just my cent and a half. To be fair, I can't compare - I've never used LastPass - I've never felt the need to explore any other options after using KeePass. Seconding Karena's recommendation — KeePass is both free and excellent. Being open-source is a fair guarantee of integrity. While others curse and complain because they're unable to recall which slight variant of their single basic password they have used for a particular site, passwords have ceased being problematic for me. I have a unique, long and highly secure password for each login and don't know any of them. All the credit belongs to KeePass, I used to be just as frustrated and poorly-secured — it took me about an hour to resolve this forever.